The King’s Speech writer David Seidler originally came up with the idea of The King’s Speech as a play but most people now know it as an Oscar winning film with Colin Firth as King George VI. 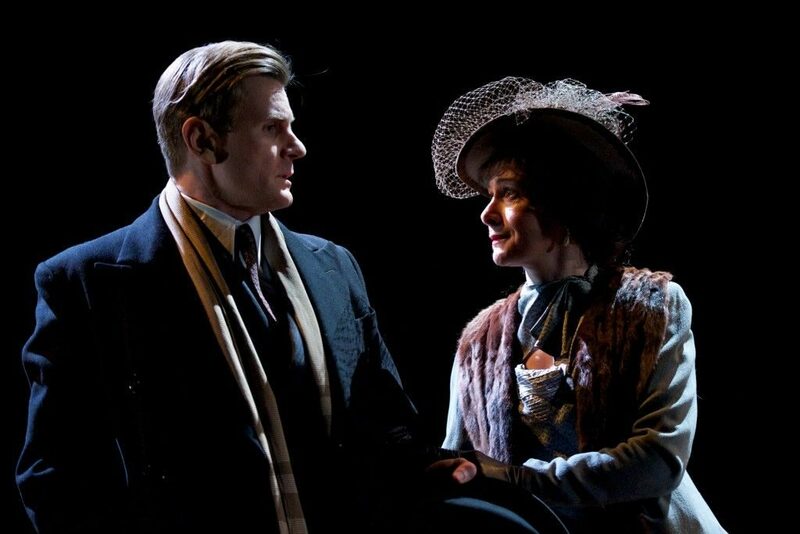 The production is now (after touring around the country) being held at Wyndham’s Theatre London. On stage David Seidler’s writing gets a fresh chance to shine and show parts the film did not. In its stage incarnation, The King’s Speech is fundamentally an old-fashioned two-hander. The future King George VI (Albert Frederick Arthur George, known to his family as Bertie) is striving to overcome his stammer. The writer David Seidler looked to King George after having a speech impediment of his own. Always wanting to write about George VI, Seidler started researching in the 1970s. After finding the surviving son of Lionel Logue – Dr. Valentine Logue (now a retired brain surgeon) he wrote to him in 1981. In turn, Logue was keen to talk with Seidler and even share the notebooks his father kept while treating the King, but on the condition that he received “written permission from the Queen Mother” first. Upon writing to The Queen Mother, Seidler received a reply from her private secretary, asking him not to pursue the project during her lifetime. Consequently Seidler abandoned the project in 1982. 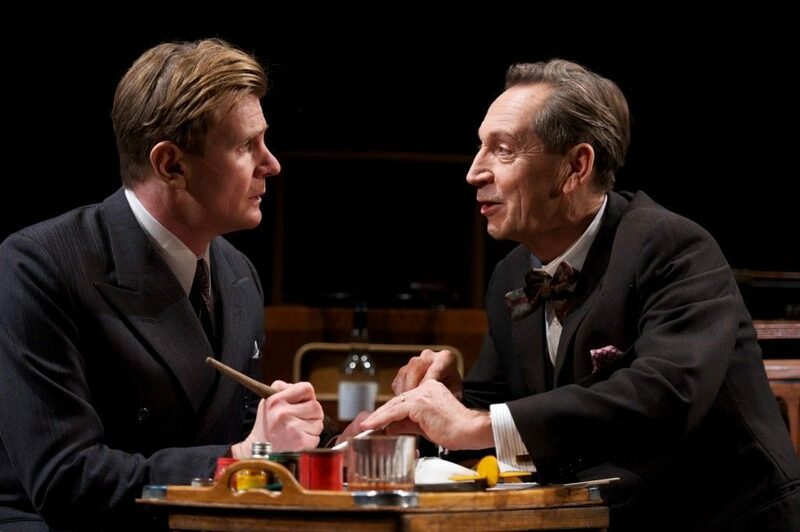 The play was then written and during his research Seidler discovered that his own uncle, also named David and also a stutterer, had been sent to see the speech therapist Lionel Logue by his father (Seidler’s grandfather). 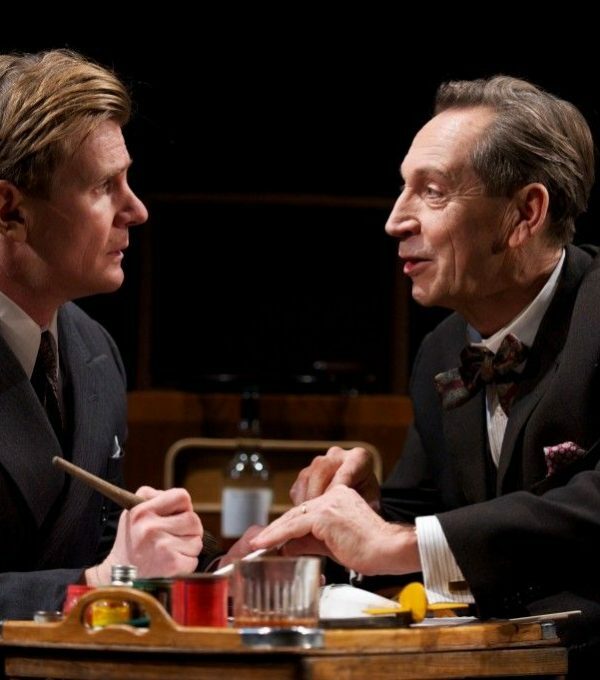 In the play there are two fine central performances, Charles Edwards as Bertie and Jonathan Hyde as self-taught Australian speech therapist Lionel Logue (Logue settled in London with the ambition of becoming a Shakespearean actor and gravitated into speech therapy), it is pure pleasure to watch the scenes between the two as a friendship grows and struggles are overcome for Bertie. The play shows Bertie shrugging off his past as Logue questions him and we learn Bertie had an unstable nanny and was bullied into using his right hand rather than his left, his wife Elizabeth (a perfectly cast Emma Fielding) almost acts as a matriarchal replacement. His father George V (Joss Ackland) comes across as a tyrant, and no less intimidating is Bertie’s bullying brother, Edward VIII (Daniel Betts) who is thrilled yet also ruined by his passion for the American divorcee Wallis Simpson (Lisa Baird). Mrs Simpson has no spoken lines, but dances up a storm in the background of Anthony Ward’s over-arched and persistently revolving set in a stunning black gown. Lionel Logue’s wife Myrtle is foregrounded, pining for her native Australia and bullying him to return home. 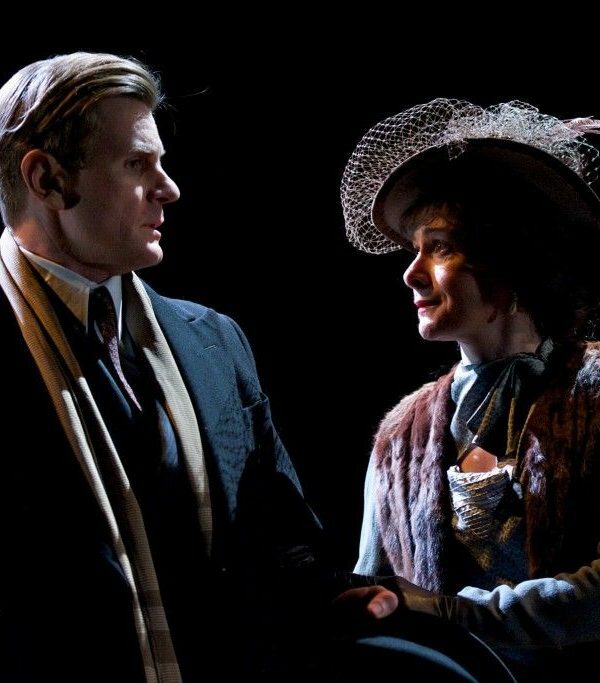 Charlotte Randle is a fine actress with great National Theatre credentials and fully captures Myrtle’s disappointment and pride in her husband. In the film we do not see much of Myrtle so it is interesting to see more about her story in the play. There are also fine performances from ‘Rent a Winston’ Ian McNeice as Winston Churchill, Michael Feast as a scheming Cosmo Lang (almost made you want to boo and hiss at him! ), David Killick as Stanley Baldwin and an ensemble that plays various servants and valets. Coming in at just over two hours (including interval) Adrian Noble has directed the play just as amusing and engaging as the celluloid incarnation. With the Queen’s Jubilee celebrations just around the corner this play may just be the hottest ticket in town to hear Queen Elizabeth’s father’s story told so well by fine actors, a beautiful set, gorgeous period clothing and a superbly royal theatre as the location. 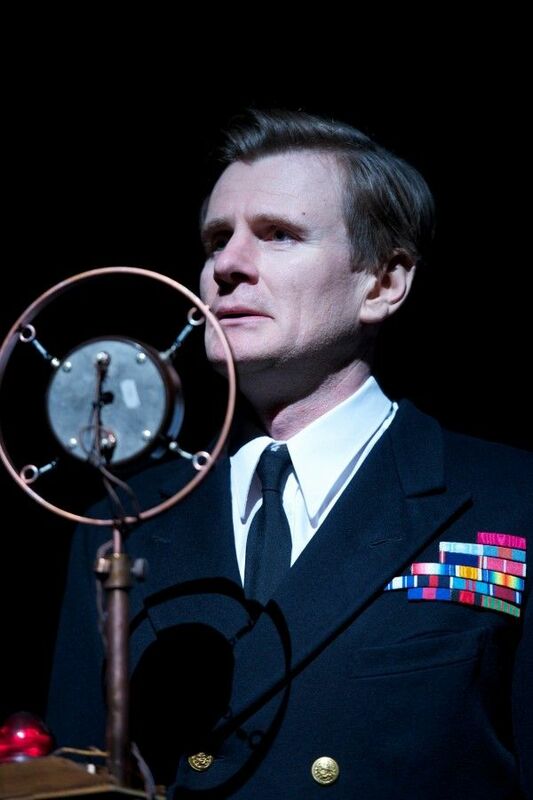 See the critically acclaimed The King’s Speech at the Wyndham’s Theatre and attend a one-off Special Event post-show Q&A with Mark Logue (grandson of Lionel Logue). Mark will be a special guests at the post show Q&A along with Charles Edwards (King George VI) and Jonathan Hyde (Lionel Logue) on April 25th.